It has been a long and intense development work with lots of quality assurance. Yet here we go: gpg4o 3.4 Beta 1 is available. We emphasized on better integration of gpg4o in enterprise environments, optimized user experience again to make email encryption even easier to use. In addition, compatibility to other OpenPGP based implementations has improved again as well as interoperability and coexistence with other encryption solutions. With version 3.3 of gpg4o we started to integrate gpg4o with central administration through Microsoft Policy Manager. In upcoming version 3.4 we improved this. Administrators are now enabled to centrally rollout the Auto Import Keyserver as well as the list of keyservers. With this, corporate governance rules and compliance regulations can be enforced on email encryption. New Functions for corporate users. gpg4o 3.4 ist enabled to verify PGP/MIME signed mail (detached signatures). This is important for applications like GPGMail. gpg4o 3.4 improves choice of keys. Coloured marks help the user to have a rapid overview over available keys, ambigous keys or missing keys. Import public keys via clipboard. Visualize public keys which have been suggested to use by sending rules or group policies. Use the “Send from” field for team accounts and role accounts within Microsoft Outlook. With this function you may send encrypted mails on behalf of your team, your boss or your role. 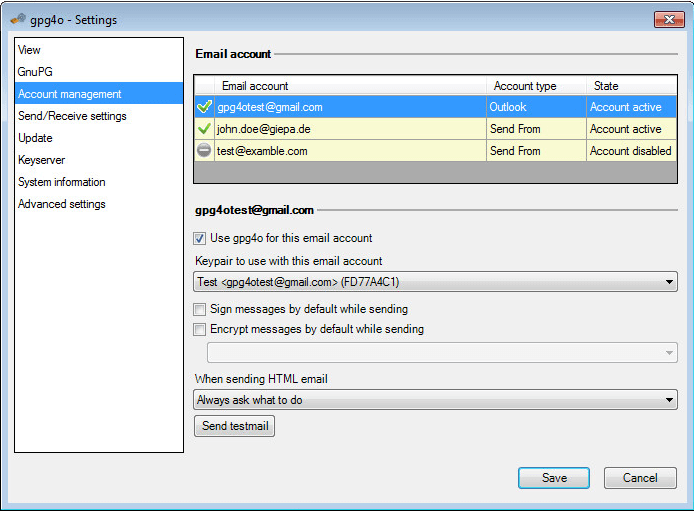 gpg4o uses virtual accounts and is able to choose the right public key to send on behalf of the team, boss or role. As usual we added a lot of smaller improvements and solved possible issues from our buglist. Download gpg4o 3.4 and use it as a trial or within your current license. As always we are interested in your feedback and comments.